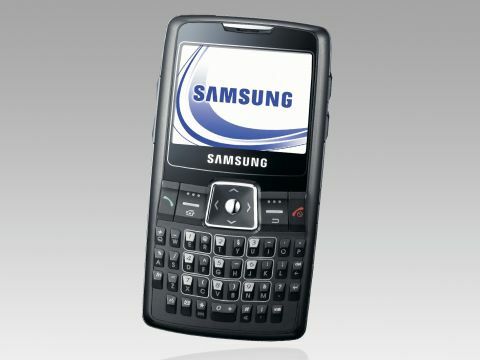 Samsung sent us the venerable SGH-i320, rather than the new SGH-i600, which has Wi-Fi. However, while these differences are hidden away, the two handsets have a fair amount in common. It's a wide - but thin - handset that incorporates a full Qwerty keyboard. Looking and feeling more like a mobile phone than a smartphone, this is an impressively light device. The keys are very narrow, but even so, the handset is rather wide and we found it awkward for single-handed texting if you have small hands. All in all, we felt the keyboard was disappointing and quite difficult to grow accustomed to. To put the dimensions of the i320 in perspective, it is the same height and width as a Palm Treo 750, yet it is half the thickness. The shape of the handset has led Samsung to orient the screen in landscape mode, which offers more width for viewing documents and web pages. The phone is very thin at 12mm, so naturally the battery is rather small. We found this was fine as long as you could charge the battery every day. This fact has prompted Samsung to include a second battery, along with a carry case that has a socket for the charging cable. This is very convenient, but we don't see why Samsung insists on using its own proprietary sockets on the handset and charger, instead of mini USB. This lack of consideration extends to the micro-SD slot which is located under the battery, meaning you can't simply pop the card out while the phone is turned on. There are a couple of annoying niggles in the specification, as you don't get 3G or 850MHz GSM for the US or, indeed, the Wi-Fi that comes with the i600 model. Overall, we felt this handset was disappointingly unaccomplished and, bar the Qwerty keypad, certainly doesn't offer anything that a well specified mobile phone should offer.